Yesterday was the first official work day of 2017. And the first day of a Brave New World for adoptees and their birth parents in the State of New Jersey. Because yesterday, the first official work day of 2017, was the first official day on which post-1940 adoptees in New Jersey were entitled, by law, to obtain copies of their original, unaltered, birth certificates. The ones with those critical pieces of information that New Jersey adoptees have not been entitled to since 1940. The ones with the names of their birth parents. From that time until today, more than 300,000 children have been adopted in the Garden State. And from 1940 until 2015, the original birth certificates of those children were sealed under that 1940 law. Nobody could see them: not the adoptive parents, not the birth parents, not the children themselves even long after they reached adulthood. The statute did have an escape valve: on a case-by-case basis, a court could order disclosure.3 But the good-cause showing required by the law was an insurmountable hurdle for an adoptee who simply wanted to know who he or she was. So the campaign to change the law began. Efforts to remove the veil of secrecy from adoption records were tried — and failed — and tried — and failed for more than 30 years. But finally, on 27 May 2014, amendments to the Vital Statistics Act were signed into law4 — with dramatic impact on the availability of information to adoptees. The law took effect in two parts. First, as of adoptions finalized after 1 August 2015, OBCs were no longer to be sealed at all. 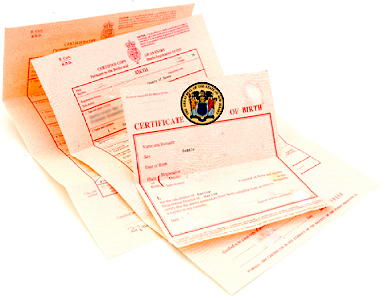 The second part is what’s happening now: an adult adoptee is now able to obtain a non-certified copy of his or her original birth certificate (OBC). Nothing will be redacted — eliminated — from the OBC unless a birth parent filed a required statement by 31 December 2016 to have his or her name redacted. Other information — birthdate, birthplace and the like — will be disclosed. And any birth parents who wanted their names redacted were required to provide and regularly update their family’s medical, social and culture histories. Even before this part of the law took effect, more than 900 Garden State adoptees had applied to get copies of their OBCs while fewer than 350 350 birth parents — impacting only about one-tenth of one percent of adoptees — had filed the required request not to have their identities disclosed. And about 100 birth parents had already filed information to help the children they gave up for adoption contact them. The requests have to be made in writing, and everything is going to be handled by mail: those who “can’t wait” can’t just drive to Trenton and camp out at the Health Department. Thank you for the clarification, Judy. I’ve been waiting breathlessly for this new law to go into effect. Now I see that it won’t help me. My dad was adopted in 1905, so when my earlier requests for info yielded no records, I guess there are no records.